According to Andika Triwidada’s notes, it’s time for all Indonesian translation team to return to right way. On this documentation, it stated that Indonesian plural form is using the form below. GNOME also use this form for Indonesian, but on LIbreOffice Pootle, those plural form never show when we used Indonesian UI on LibreOffice. On gettext manual, it stated that the right plural form for Indonesian (Austronesian family) is Two forms, singular used for one only. So, 2019 is the time to move to the form stated by gettext. I made this repo for GNOME Indonesian translation team for listing the .po files that using the plural form. 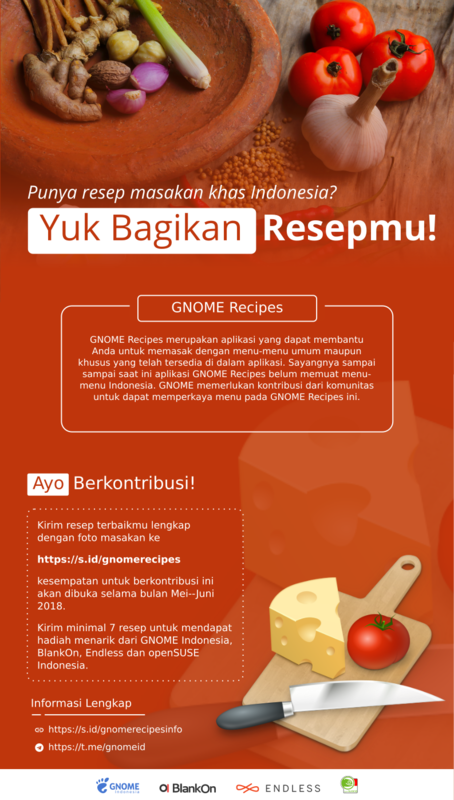 Finally, after some delay, we finished to submit recipes from GNOME Recipes contest that we held on last May-June 2018. We have 4 submission with 21 recipes. 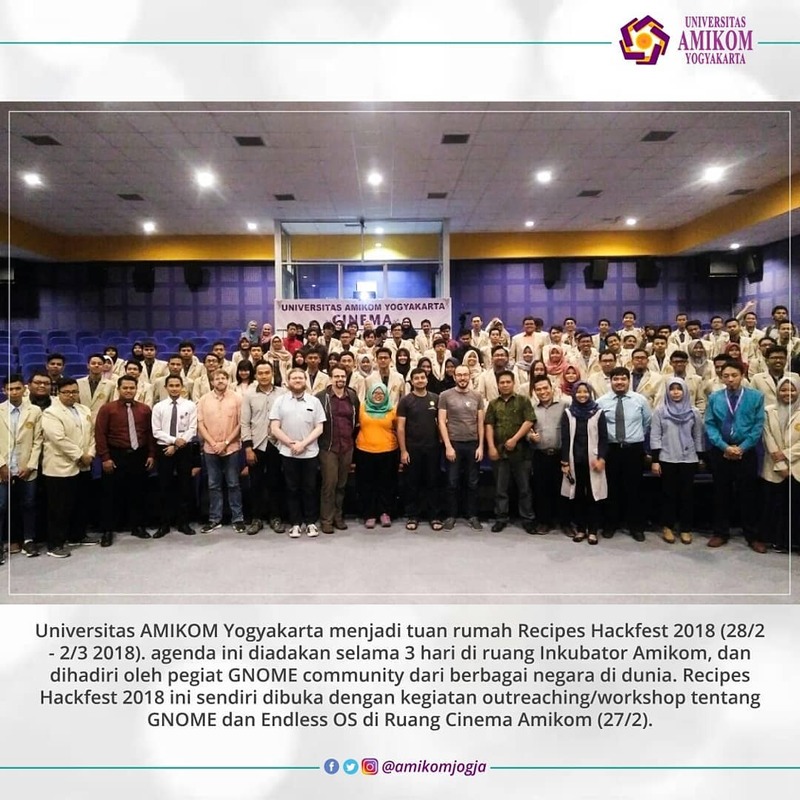 We have two winner for this contest, both of them are from Yogyakarta, same place with the recipes hackfest was held. Congratulations to Budi Aryo Yuli Utomo and Pipit Nur Rahma. We already sent the gift (shoes from FANS and community stickers, including GNOME, openSUSE, Endless and BlankOn) to them. 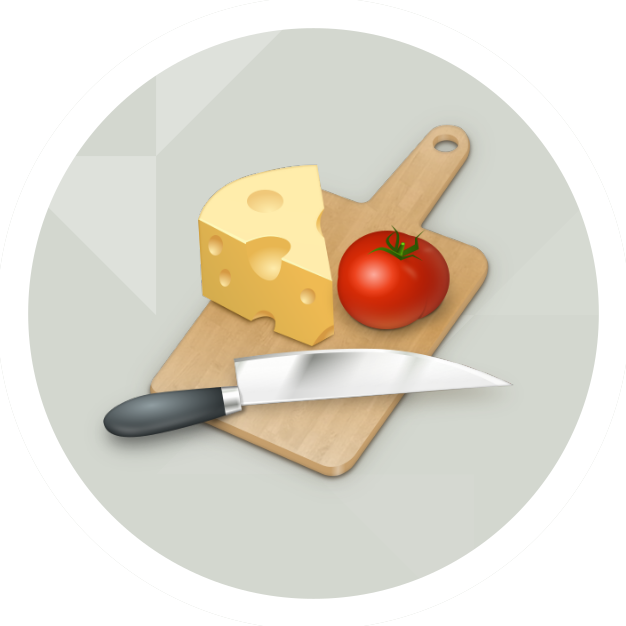 for arrange contest, make an artwork, translation the recipes, and input it to GNOME Recipes. I was finishing the UI translation for the next GNOME 3.30 release, unfortunately our coordinator, Andika Triwidada, quiet busy with Asian Games 2018 so that he can’t reviewing and committing the translations. Then, today i becoming committer on GNOME l10n Indonesia, Andika promote me from reviewer to committer so i can help him to commit the translations. I’ll commit the UI translations and hope it will be ready for GNOME 3.29.92 (GNOME 3.30 RC). You can help us to reviewing the UI translation by downloading the GNOME Next iso from openSUSE or Fedora Rawhide. GNOME 3.30 will released on September 5. Have fun. Me with the boards of director. L to R: Nuritzi Sanchez (GNOME), me, Ekaterina Gerasimova (GNOME), Ana Maria Martinez Gomez (openSUSE). This conference was special because it combined COSCUP, GNOME.Asia and openSUSE.Asia in one place. The conference was held in NTUST, Taipei City, Taiwan on August 11th-12th. The attendance numbers was 1364 people on day one and 784 on day two. For me, it’s my second time for GNOME.Asia Summit and third time for openSUSE.Asia Summit. I gave two talks, one on GNOME.Asia track, one on openSUSE.Asia Summit track. We from Indonesia had a large number of people including from openSUSE, GNOME and LibreOffice-ID about 15 people. Day 0 was on Friday, Indonesian team went to Taipei Grand Mosque for Friday praying. 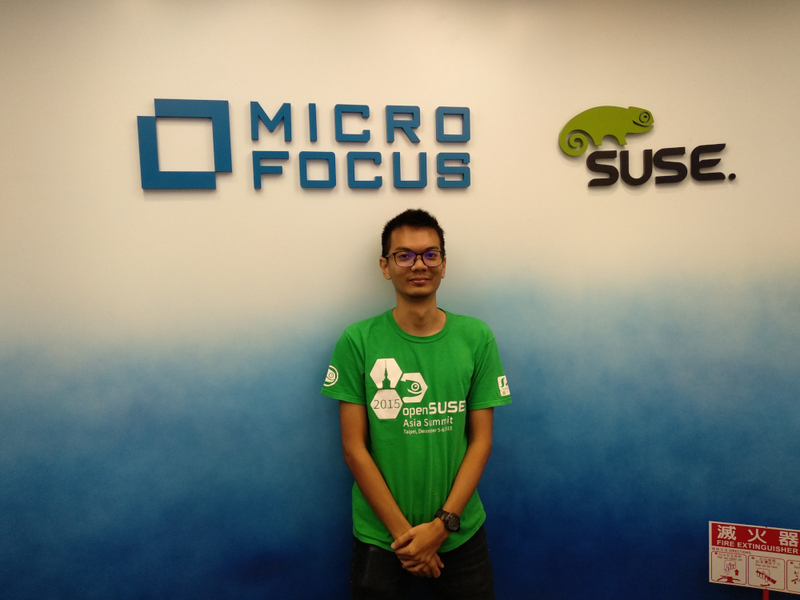 After that, we went to SUSE/MicroFocus Taiwan office for openSUSE.Asia Community Meeting. On the evening, we had dinner with Franklin Weng, Shinji Enoki, DaeHyun Sung and Nientsu. Then we went to welcome party by COSCUP. Day 1 opened by openSUSE Board member (Ana and Simon), i missed this keynote. I was stand by on one of GNOME room on #301 because i’m taking care of GNOME slipers/sandals that i bring from Indonesia. “Supporting Miracast on the GNOME Desktop” by Benjamin Berg was my first talk that i attend. Then i attended “Desktop applications: life inside a sandbox” by David King, ” The Year of the GNOME” by Nuritzi Sanchez and “Plan your testing” by Kat Gerasimova. 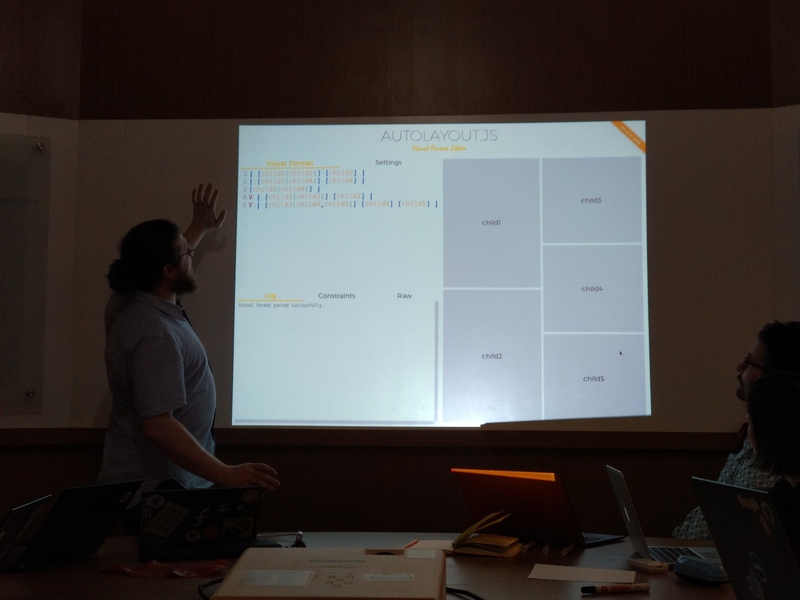 Then i moved to openSUSE tracks, among them “Journey to openSUSE Leap 15.0” by Max Lin, and “How Jogja Become City of GNU/Linux User Friendly” by Estu Fardani. Day 1 closed with “The bright future of SUSE and openSUSE” by Ralf Flaxa (President of Engineering for SUSE). In the evening we had BoF sessions. 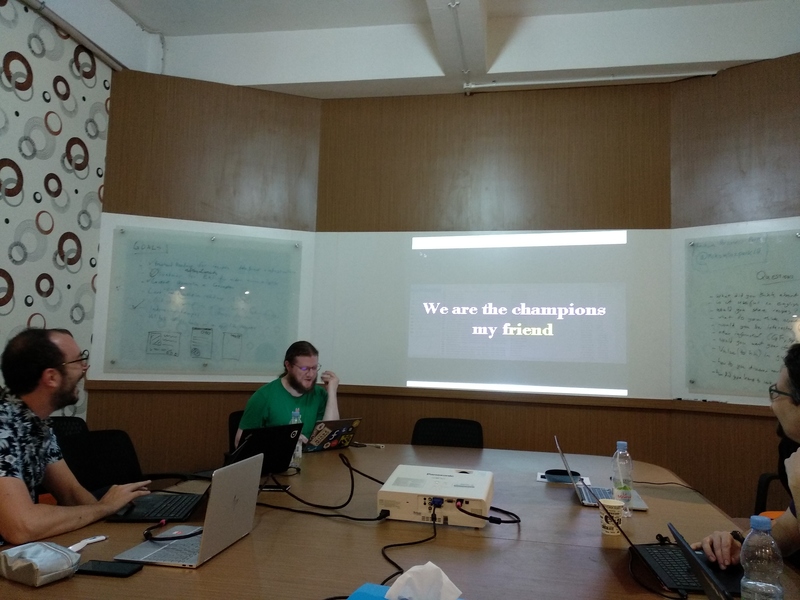 First, i attended openSUSE BoF session because i’m presented about openSUSE.Asia Summit 2019 proposal. 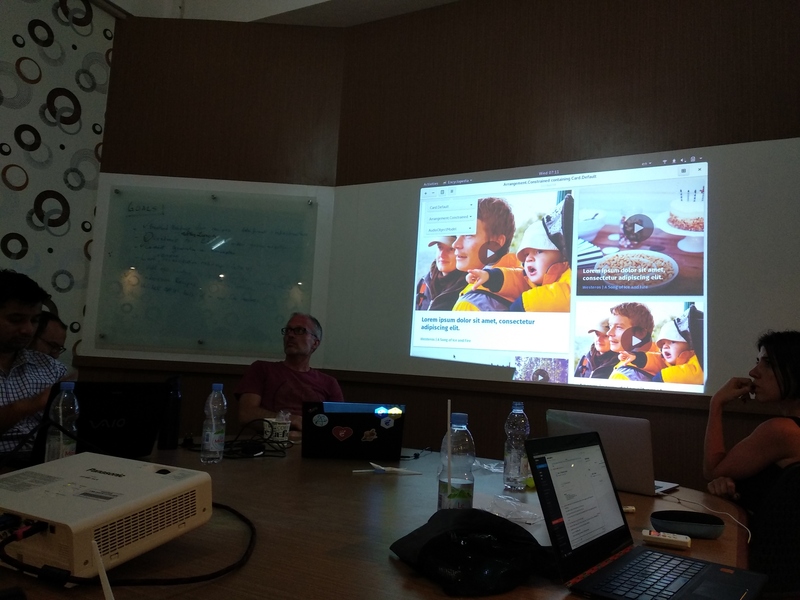 Then i attended GNOME BoF session although i’m late. Day 2 started with keynote “Welcome to Year 22” by Kat Gerasimova and Nuritzi Sanchez. 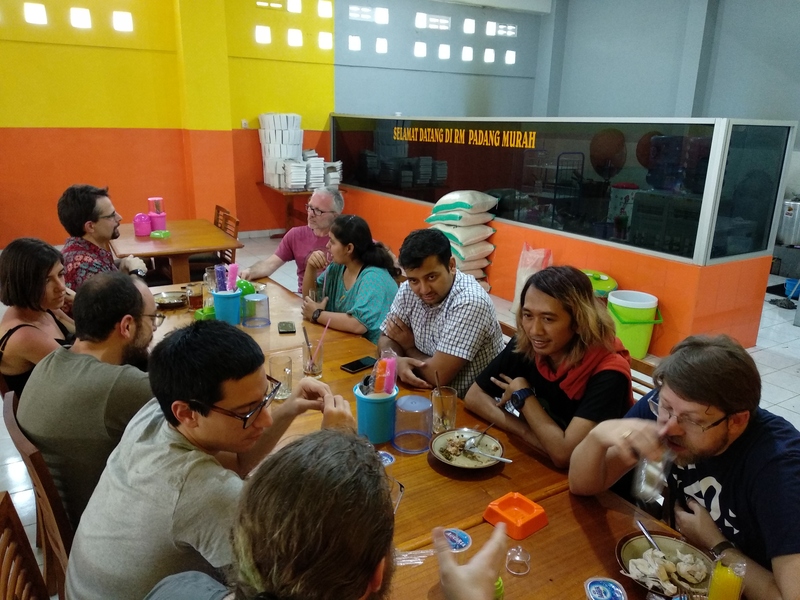 Then i attended “Introducing Team Silverblue” by Matthias Clasen, “Flatpak vs. Snap” by BinLi, and “Using Inkscape To Design Shoes” by Iwan Tahari. 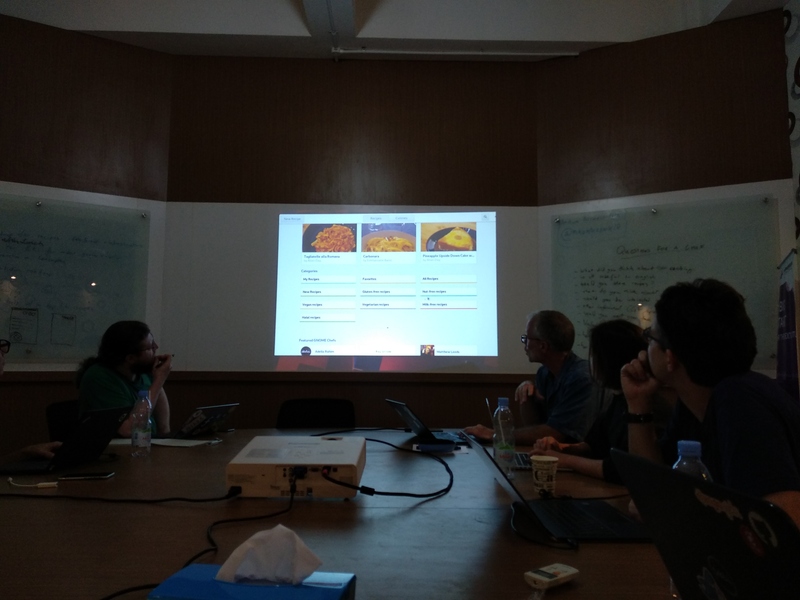 After lunch, it was my turn to run marathon of presentation. 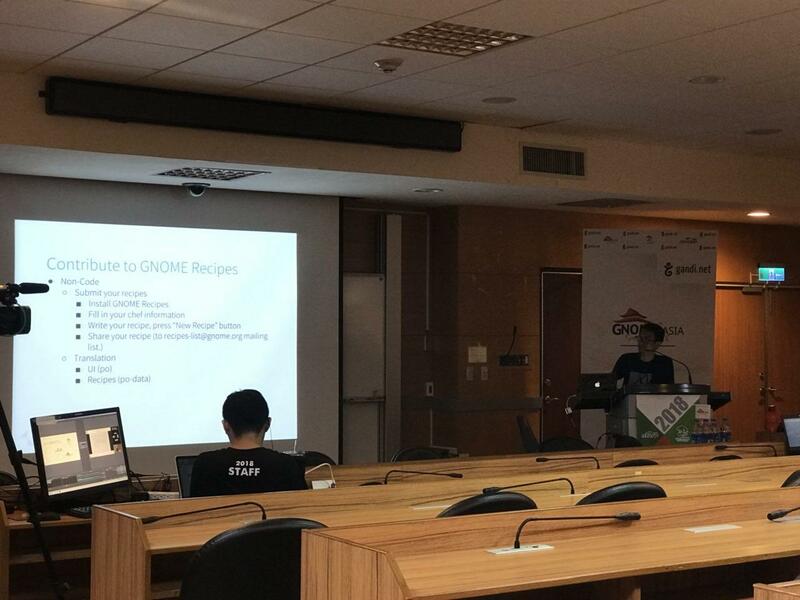 My talk on GNOME track was “GNOME Recipes & Local Wisdom” and on openSUSE track was “openSUSE Leap & Flatpak”. After that i moved to openSUSE track “Introduction of Open Build Services” by Alcho and “Having Fun With KDE: Create A Plasmoid” by Yan Arief. 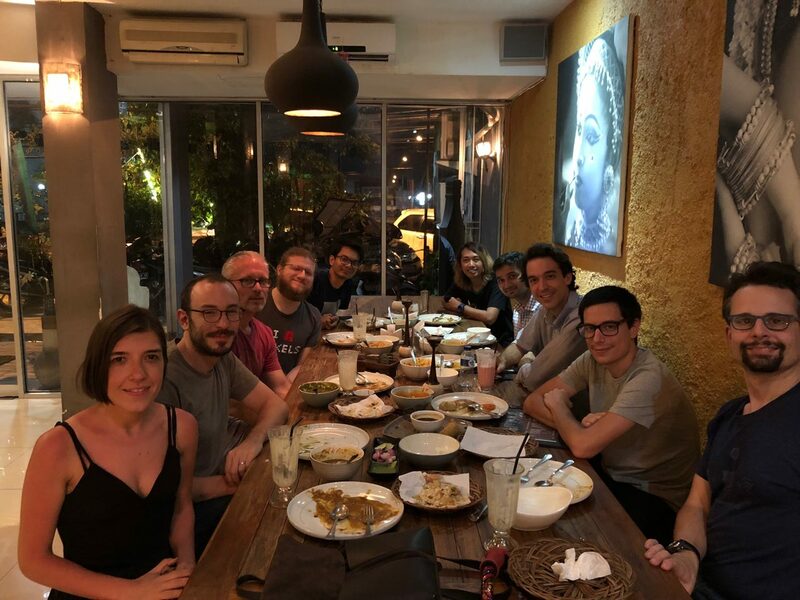 In the evening i had dinner with COSCUP team in the most delicious seafood restaurant on Taipei (sorry, forgot the name). 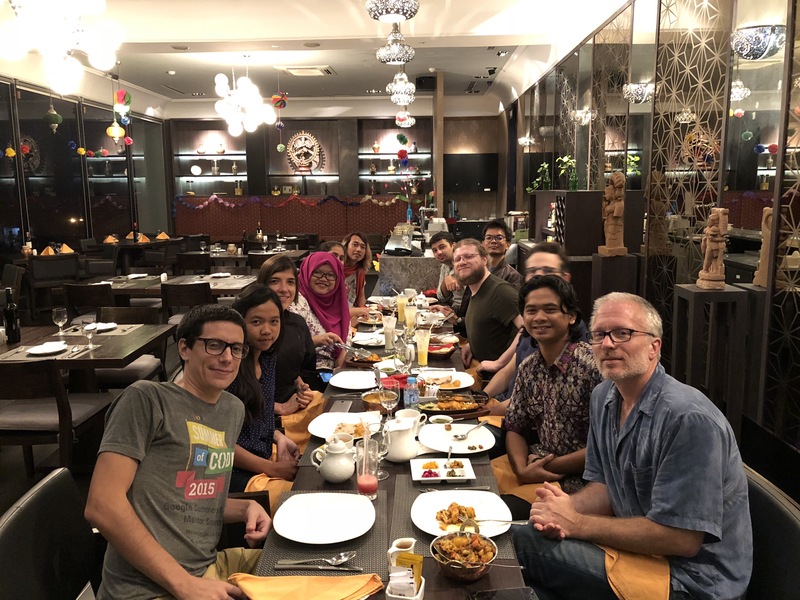 I was the same table with Max Huang, Sunny, Edwin Zakaria, Ahmad Haris, Fuminobu Takeyama, Naruhiko Ogasawara, and Syuta Hashimoto. Day 3 was one day tour. The first destination was National Palace Museum. I found the origin of “Mangkok Ayam” (Chicken Bowl) that popular in Indonesia. The second destination was Taipei 101, the world’s tallest building in 2004. In the evening i had last dinner with Franklin Weng and Eric Sun from Ezgo. It was fun. 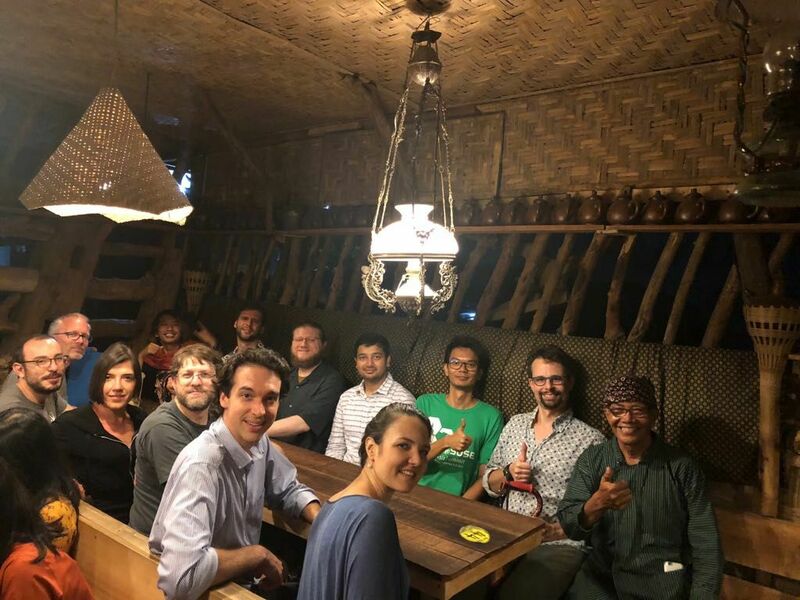 Because i’m part of GNOME foundation member and openSUSE member, combining two conferences that I part of them made easier for me to meet people from both of them even though I couldn’t attend all the talks. What i expected there are GNOME booth with swag and conference t-shirt, but none of them. Thank to Max Huang and team for awesome conference. Thanks to Franklin Weng and Eric Sun for dinner and ezgo t-shirt. Thanks to Nuritzi for GUADEC gift .ありがとうございました Ogasawara-san for Nikkei Linux Magz. Special thanks to openSUSE for sponsoring my flight and GNOME Foundation for sponsoring my lodging.